DODGE CITY, KAN. — Dodge City Community College women’s basketball coach Zach Loll drew up a play for his team to run with under 5 seconds remaining and trailing No. 6 Butler, 53-50. The play would be drawn up for sophomore Addison Rowley and Rowley got off a good look as time expired, but her shot was just off the mark and the Grizzlies would hold on for a three-point win. It was fitting for the game to go down to the wire, as both teams were going back and forth throughout the night. The Conqs made a great comeback, but came up just short. The Conqs struggled to shoot the ball offensively, as they shot just 28 percent from the field. That mark is the worst that they have shot the ball this season and somehow only lost by three. Butler also outrebounded the Conqs 44-34. Dodge City had three players score in double figures once again, as this is the third straight game that at least three players have done so. Rowley led the way with 14, while Makaela Ewing added 11 points and Haleigh Hill finished with 10 points. 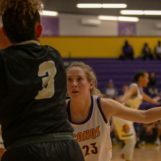 The Conqs showed they can shoot the ball from outside once again, as they buried eight three-pointers. Rowley and Hill both knocked down two from outside, while Ewing, Ashley Nelson, Allie Baker and Faith Catthouse all added one. Butler was led by three players in double figures with 10 points apiece, Camille Downs, Jalise Smallwood and Taylor Birch. The Conqs now fall to 7-4 on the season and 2-1 in Jayhawk Conference play. The loss ended the Dodge City five-game winning streak. What’s Next? The Conqs will travel to Concordia for a rare Friday night game to play the Cloud County Thunderbirds. The game was pushed ahead a day from the originally scheduled Saturday game due to the Concordia High School basketball tournament. The Conqs and the T-Birds will tip-off at 6 p.m. from Arley Bryant Gymnasium. Note: There will be no audio broadcast on Friday due to Dodge City High School playing, so Z98 will have the high school game and not the college.